"Cat Psychology at it's finest"
At Catitude Clinic we employ a licensed veterinarian and a cat behaviorist with certification (associate certified by the IAABC) and formal study in cat behavior. They take the time to practice responsible and ethical behavior care for cats. We offer regular and drop in consultation appointments to provide you and your cat(s) an effective and all-encompassing behavior plan. Dedicated to the study of cat behavior, Catitude conducts behavior studies as part of many of our behavior consultations. This invaluable information benefits not only the consulting cat and owner, but also the lives of cats everywhere. Many people will tell you that it's impossible to train or otherwise change the behavior of a cat. 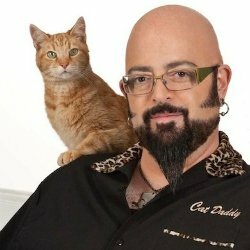 But over the last two decades our behaviorists have successfully applied a method consisting of compassionate awareness and three-part behavior modification to help resolve the unwanted behaviors of thousands of cats, and we're here to show cat lovers that cats' behavior can be reliably and consistently changed for the better. We'll show you exactly how, using the uniquely effective three-stage method of solving every one of the seven major cat behavior problems. 9/10 cats would reccomend Catitude. That last one has had too much catnip.